Foreign Minister Elmar Mammadyarov congratulated Michael Heinritz his appointment as an honorary consul to the city of Salzburg covering the Salzburg, Tyrol and Vorarlberg states of Austria, AzVision.az reports citing the press service of the Foreign Ministry. Touching upon the recent working visit of Ilham Aliyev, President of the Republic of Azerbaijan to the Republic of Austria, Minister Elmar Mammadyarov emphasized that very useful meetings were held on the sidelines of this visit. 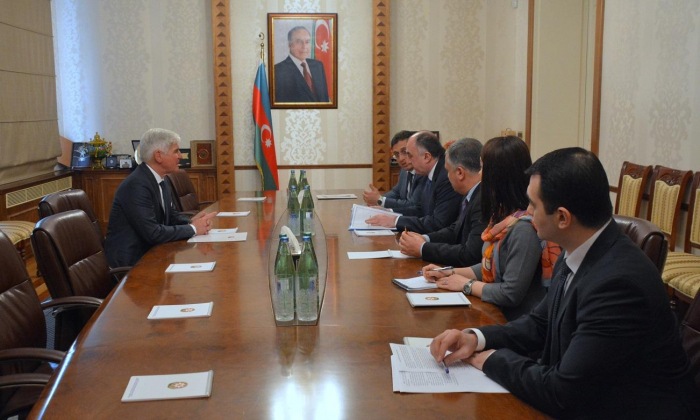 In his turn, M.Heinritz underlined that he is honoured to represent Azerbaijan and noted that he will continue consistent activities for further expansion of the bilateral economic-trade relations, especially for the promotion of cooperation in the non-oil sector between Azerbaijan and Austria. Honorary consul noted that he would spare no efforts to contribute to the development of comprehensive cooperation between the two countries.